Babies are not as adaptable as adults to temperature change. A baby's body surface is about three times greater than an adult's, compared to the weight of his/her body. Babies can lose heat rapidly, as much as four times more quickly than adults. Babies under 3 months have difficulty regulating their own temperature, even in a warm environment. Babies swaddled in merino are less likely to suffer from overheating. Made with superfine, bleach free, fire retardant merino, our Cocooi babywraps, Go Go Bags (baby sleep bags) and Merino Kid Clothing ranges breathe by absorbing and releasing moisture away from your baby in warm conditions and insulating through cooler times. 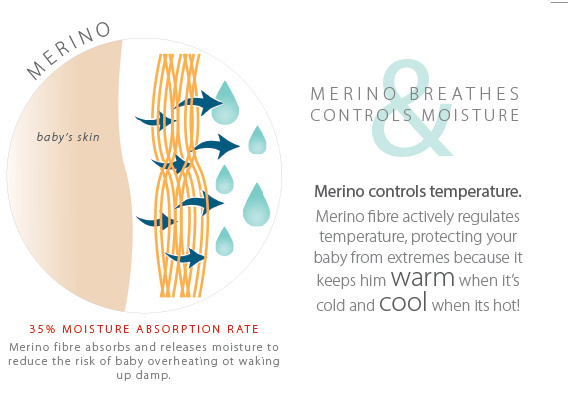 This unique feature creates its own microclimate around your baby, regulating his temperature. In essence, your child becomes perfectly adapted to his sleeping environment.